The following bulletin was obtained from the website of the Department of Education. Since April 2016, a loosely affiliated group of highly trained hackers calling themselves TheDarkOverlord (TDO) have conducted various extortion schemes with a recent focus on the public school system. TDO used remote access tools to breach school district networks and then proceeded to steal sensitive data. To extort money from its victims, including students, TDO threatened violence or the release of stolen sensitive data. 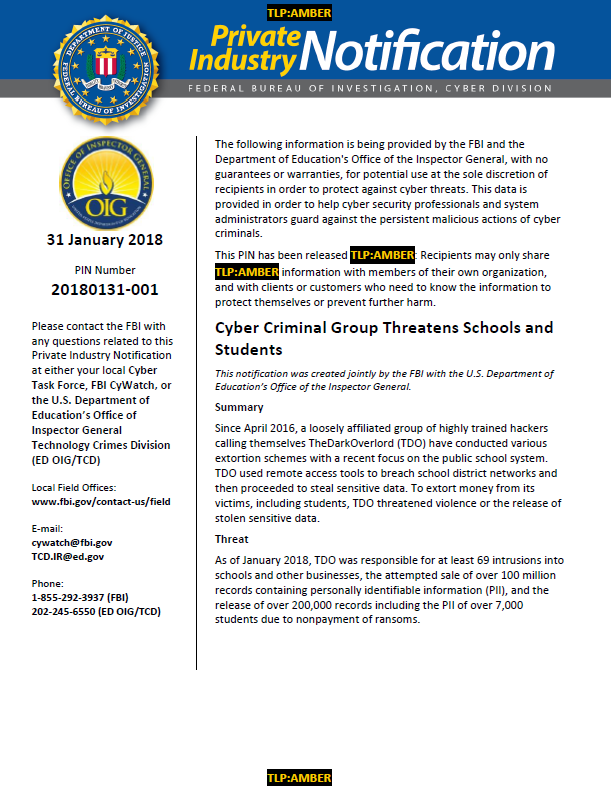 As of January 2018, TDO was responsible for at least 69 intrusions into schools and other businesses, the attempted sale of over 100 million records containing personally identifiable information (PII), and the release of over 200,000 records including the PII of over 7,000 students due to nonpayment of ransoms. TDO typically opens communications via e-mail with veiled threats of publicly releasing or selling the victim’s sensitive information. However, in September 2017, TDO escalated its tactics by threatening school shootings through text messages and emails directed at students, staff, and local law enforcement officials. As a result, several schools receiving these threats shut down for one or more days as a safety precaution. TDO then contacted the school districts several days later, demanding payment to prevent the release of student data on the internet. TDO engages in a pattern of verbal abuse and threats of violence during communication with victims, regardless of the victims’ willingness to pay extortion demands. In a recent incident, TDO threatened to publicize the sensitive behavioral reports and private health information of students. Throughout September and October 2017, TDO was reportedly connected to multiple threats of violence on school campuses, often prior to extortion attempts. These threats caused panic, but provided TDO with no apparent monetary gain. If applicable, maintain a timeline of the attack, recording all times and content of the attack.